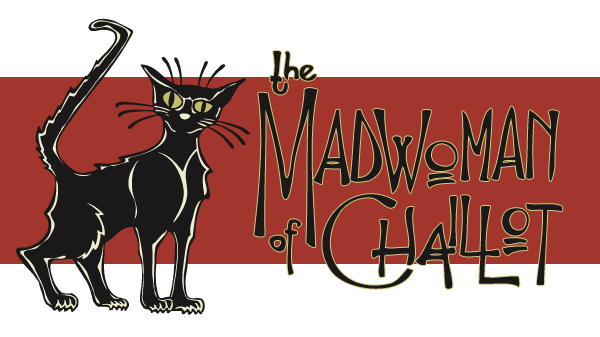 There is a really cool theatre project happening in Charlottesville right now called The Madwoman Project. As the Madwoman project website describes it this production is what happens…. It is a production of Jean-Giradoux’s “The Madwoman of Chaillot” done in the Comedia dell’ Arte style with over blown acting and goofy costumes. 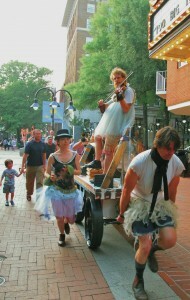 The actors roll a wagon of props and set pieces down Charlottesville’s Downtown Mall, set up and perform the first act of the play al fresco a la street theatre then pack up and proceed to The Sanctuary at the Haven (a homeless shelter) to perform the second act. I am a big fan of the melodramatic style of Comedia dell’ Arte and love how it takes the blatant political nature of the play to a palatable level for a wider audience. The performances, direction, costumes and set are all marvelous. Being a kinetic ADHD person, moving from one venue to the next was a fun change of pace. 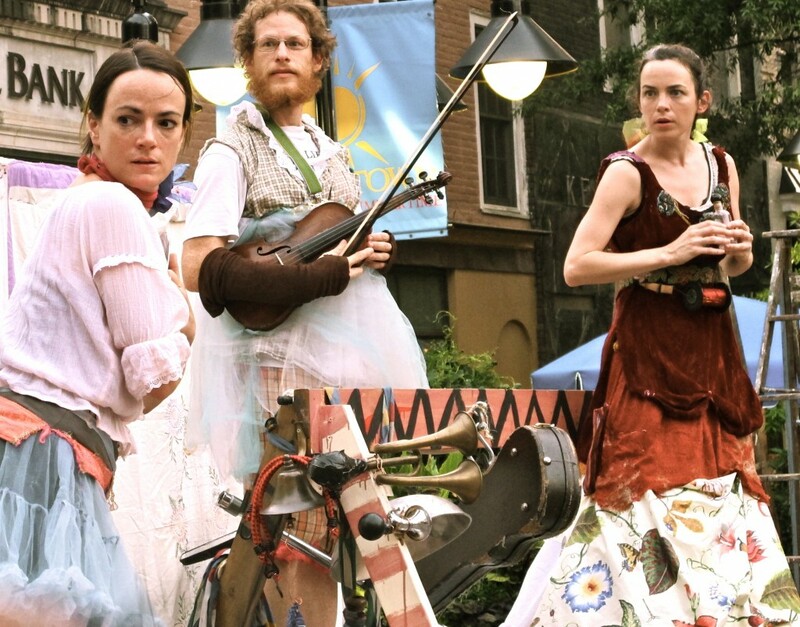 The street performed Act I particularly appealed because of the transient nature of the audience. One goofball pedestrian walked right through the playing area. The best part were the kids in the audience. I was seated on the ground next to two vibrant, articulate children both under the age of 6. They made wonderful observations about the actors, pointing out gestures and costume pieces they thought were funny or interesting. Perhaps Producer/Director, Kay Leigh Ferguson chose the show for it’s political message and staged it in a way that everyone could see it for the very reason of using it as a mouthpiece for her own political views. Perhaps she is a Mad Woman, tired of the dangerous level of disparity happening in our country right now. Or Not. It is still timely and fun and I recommend catching it this weekend. For more information on The Madwoman Project click here. The Hamner Theater on behalf of the CVTA (Central Virginia Theater Alliance) is pleased to announce the first ever area-wide general auditions to be held on Sat., Oct. 13 at PVCC (Piedmont Virginia Community College) in the black box theater in the V. Earl Dickinson Building. This is an opportunity to be entered in the Players Guide for the area, a resource for all producing theaters and companies. Attending theaters are Ash Lawn Opera, Heritage Theater Festival, PlayOn!, Four County Players, the Hamner Theater, Live Arts, Offstage, Big Blue Door and our host, PVCC. Actors are asked to prepare one or two contrasting monologues (classical/contemporary or comic/dramatic) or if musical theater is your thing, a monologue and 32 bars of a song. There will be an accompanist on site. Auditions will be held from 10am – 1pm – please sign up for a 5 minute slot on the CVTA website, www.cvta.info. We ask that actors bring a headshot and resume – we will have a digital camera at the auditions in case you have no headshot and there is a form on the CVTA website that will do for a resume. This is an opportunity to see the theatrical options available in the area – different theaters do different kinds of theater – and to talk to the different theater representatives and find out what’s going on in their venues. It is also an opportunity to be seen by the Artistic Directors of the area theaters as well as directors of season productions on an occasion when they are not all trying to cast a specific part – you the actor are there to present yourself and be entered in the area guide to actors. This is an exciting event, long overdue – many regions have general auditions twice a year! Don’t miss out on this opportunity to be part of the larger Central Virginia theater scene. For further information call 434-361-1999 or email info@thehamnertheater.com. You are receiving this email because you signed up at the theater or online. The American Shakespeare Center in Staunton is currently running five shows in repertory in its stunning Blackfriars Theatre through November 24th, one of them being an excellent production of Two Gentleman from Verona. Deftly directed by ASC’s Director of Mission, Ralph Cohen the show is at once familiar and refreshingly different as elements of several other Shakespeare plays like women dressing up as men and hiding in the woods, an inconstant lover and a planned elopement. And though Cohen is most gifted at working with actors to make music out of Shakespeare’s words and the regular company of players is very good, the scene stealer is the guest artist that plays Crab the dog. Two Gents in many ways is a commentary about trust and loyalty between friends between lovers and also between masters and servants. Launce and his relationship to his dog sort of summarize the message of the play. 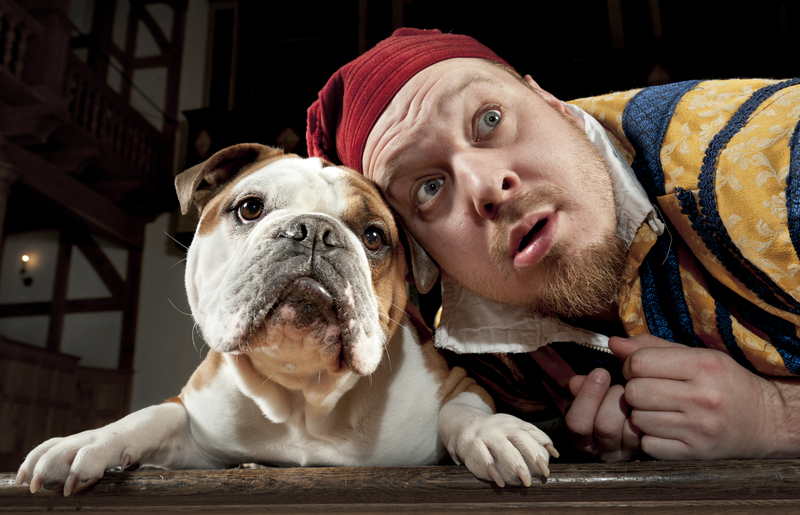 The “dog”, a term used most often by Shakespeare’s characters in a derogatory way, (as Cohen points out in his director’s notes) is present to show that even a dog behaves better than most people. Comic actor Benjamin Curns who plays Launce works brilliantly with his four legged scene mates who come from Augusta Dog Adoptions a nonprofit organization that rescues dogs and finds foster homes for them until they are adopted. The challenge for him as actor is that the dog in the show will behave like a dog no matter what Curns says. He must be able to adjust to whatever the dog is doing in a split second and make the language make sense in the moment while staying true to Cohen’s vision for the scene. I mean the dog, even if trained, is still a dog and therefore somewhat unpredictable. MB: What is the biggest challenge that comes with working with four legged actors? BC:The biggest challenge is the play itself. What I mean is, the dogs are adorable and cute but Launce doesn’t talk about how they are adorable and cute, he talks about how heartless, unfeeling, and dangerous they are. So an audience can feel genuine pity for the dog,rather than the dogs character and feel genuine ire for me the actor, rather than the character. One must walk a fine line of playing the scene honestly while making sure the dog and the audience feel safe. MB: Would you be willing to share a particularly funny story about working with one of the dogs in the show? BC: The dogs have been very entertaining to both me and the audience. They’ve cried out in the middle of scenes, laid down and refused to to leave the stage , and gotten surprisingly “amorous” at times. Mostly it is great whenever they are sweet: we had a dog that as soon as I began to pet him, he collapsed to the stage and rolled to his back to expose his belly. They all think it is all about them! MB: Do you have a favorite dog that you worked with so far? BC: I think my favorite dog is a hound dog mix named JR Ewing. As soon as I saw him, I thought that this was look for Launce’s dog. He is very sweet, funny, and he shakes hands on cue which we used to great effect! MB: How many dogs have been adopted from being int the show? How do you feel when they leave? BC: I think 2 of the four have been adopted though I am not positive of those details. (ASC will host a dog adoption event in October.) The adoptions are, of course, bittersweet: it’s great these dogs find families and new homes but I do miss them when they go. Just when you start to figure out how to deal with each individual dog, they’re off. Believe me though, I would rather they all get homes. If we run out of dogs, I’ll tell James Keegan to put his dog suit back on. Lastly, I hope your readers know that these shelter dogs are not mangy, violent, ugly, or beat up in the least. I am not particularly adept with dogs myself but I have found these animals to be adorable, well behaved, hilarious, and easy to get along with. Anyone looking for a great night at the theatre and a possible new pet should check out Two Gentlemen of Verona. I met Civil Libertarian of Paula Jones fame, John Whitehead a couple of weeks ago and had the pleasure of chatting with him about his art. He is a super smart guy – even if we fail to see eye-to-eye on everything- and it was fascinating peering into his brain via his water color and oil paintings he creates at his kitchen table. C-VILLE WEEKLY commissioned me to blog about the show but there was not room in the dictated word count to describe any of the paintings that seemed particularly important in Whitehead’s first public art showing, Instant Karma, at the Firefish Gallery in Charlottesville (up through October 25th). Click here to see all of the paintings in the show. 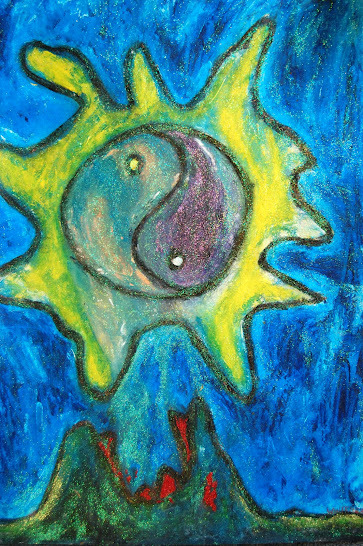 INSTANT KARMA, the title painting of the show depicts a yin/yang symbol floating in the center of the page radiating a yellow aura in a textured azure sky energy. Beneath the suspended symbol is a green “earth”, mouth-like with glittered red accents which has either just given birth to or is ready to swallow the orb, “depending on your karma,” as Whitehead puts it. THE OTHER SIDE: Five grey-washed ghostly figures floating mid paper suggesting disembodied souls waiting to greet another soul (the viewer) in the next life. The use of a white glitter wash produces a mystical other-worldly mood. Thick yellow slashes on the upper left side might be shooting stars or other souls ascending. ALPHA AND OMEGA: Figure seated in a meditative position. Flames shoot from extended fingertips an eye in at the heart chakra, a sunburst at the bottom center hiding the feet and groin of the figure. A yellow shroud is draped from the head down to the waist a bright yellow sunburst sits halo like behind the head. The face is replaced by four oval shaped circles with a blue center, orange spikes surrounding. Oil paintings: faces and figures expressionistic much more mature and advanced in terms of execution, use of color and composition. SELF PORTRAIT WITH BALLOON: A gaunt angular face with blue and yellow tones and orange accents with a orange orb upper left corner with an orange “tail” or string – a balloon indicating disembodied spirituality. Water Color subject matter: The Beatles, bleeding candles and flowers, all manner of crazed looking faces- angst ridden and intense in their expressions and bold colors. bi-polar manic energy. Doug Schneider is a long time favorite entertainer in the Charlottesville area. In the spirit of giving back to the theatre that has supported his yen for performing over the last two decades, he is hosting a fundraiser cabaret at LIVE ARTS. We recently sat poolside one sunny afternoon and chatted about his life, career and what he is cooking up for the benefit. CN: How long have you been involved in theater? DS: I’ve been involved in theatre for 44 years. I started doing plays in High School in Southern California with a drama teacher, Bob Carrelli, who also taught Val Kilmer, Mare Winningham and Kevin Spacey. Then I went to Northwestern and UCLA as a drama major until 1975 when I graduated. While at UCLA I started acting classes with Maria Gobetti and started singing in show case night clubs. So I pretty much decided I wanted to be a singer rather than an actor. In 1977 I started writing my own songs and moved to New York in ’78 to be a singer/song writer. I landed a part in a Moliere play in a regional theatre in Michigan and that earned me my Equity card. In 1983 I did one other play called “Nite Club Confidential”, an Off-Off Broadway hit. I didn’t go on to do the play Off Broadway because I joined a Commune which is what brought me to Virginia in 1987. CN: How long did you live in a commune? DS: About eight-and-a-half years.We all moved here and bought a huge house and big piece property and planted a garden. Ultimately we folded. CN: What did you do after leaving the commune? DS: Well, I decided to cut back a little on working. I was teaching voice lessons and waiting tables and I sat back and decided to hang out for a while until I knew where I wanted to move next. I had no intention of staying in Virginia at the time. I moved into a little cabin on a farm and started writing some songs. A friend in the music business suggested I make a demo and he would help me get a publishing deal. I made a CD which I am very proud of. CN: When did you get back into live performance? DS: I sang for a celebratory evening at LIVE ARTS to benefit Children Youth and Family Services of Charlottesville. As a result of that, John Gibson, asked me to vocal direct for Three Penny Opera. I did my CD release party and vocal directed for two other show. Then Bill Thomas asked you to audition for and vocal direct La Cage aux Folles. I auditioned for the role he asked and I sucked! Then he asked me to audition for Zaza, the drag queen role and I got the part. It was my first lead in a musical and my first acting role in Charlottesville and first time acting in a dozen years. I figured it out once, but conservatively I think I have done close to 30 productions plus concerts, showcases etc adds up to 40. CN: Tell us about your upcoming show at LIVE ARTS benefit concert. DS: It is the 3rd one I have done it for LIVE ARTS and it is called “If I Sing” which is from the title of a song from the show Closer Than Ever. It is very close to a one man show, I have some friends singing with me in the first act but the second act is all me. I’m singing some Broadway show tunes, a couple of old jazz standards and a few classic pop tunes, one original song written by a friend of mine from New York. It’s a cabaret theater setting with a few surprises. All of the proceeds go to LIVE ARTS – every dime! The Tom Collins Trio consisting of Joe Bunts on base, Dave Youel on drums and Greg Harris on keyboards is accompanying me. Show dates are Friday and Saturday September 14 and 15 at 8:00pm. Doors open at 7:30. Tickets are available online, through the box office or at the door. Regular tickets are $25.00 and VIP seats are $50.00. VIP includes a cocktail table, a comfy chair and close to the stage. 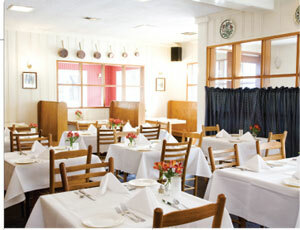 A Charlottesville favorite, Duner’s is actually in Ivy which is an exit west of “town” on 64. I went last Saturday night with a lovely gentleman who is a regular customer, eager to introduce me to a local stand-by that I had yet to try. The atmosphere is open and a bit” beachy” as one might suspect by the name with white painted wood and fairly bright lights- a friendly if a bit shabby feel. The place was packed with what looked like a fairly upper-middle class white crowd, sort of preppy but that is to be expected in UVA country particularly on the night after the first football game of the season. We had a glass of wine at the bar (not memorable but perfectly drinkable) and sat at a quaint table in a dining alcove to the right of the restaurant as you walk in. The European style wall mounted AC unit was leaking a bit spitting the occasional drop of frigid water on my so I moved seats across the table to have a view of the damaged wall and peeling wall paper resulting from inattention to the drip. Not the best visual for a nice dinner but, hey, for me it is all about the food. I ordered Panko Crusted Fried Oysters with Cilantro-Chipotle Aïoli for my first course. I found the panko a tad bland with the oysters creating a gooey texture in the mouth. The sauce was a nice blend of spices with only a small kick from the chipotle but not good enough to overcome the bland flavoring of the Panko. The Hanger steak served on a polenta cake in a red pepper sauce (is that right?) was a fantastic choice for an entree. The steak was cooked perfectly into tender melt-in-you-mouth slices and the polenta cake nicely seasoned, satisfyingly crusty on the outside and a good stand up consistency on the inside. The remainder of it was even better when I polished it off the next day for lunch. YUM. For dessert we shared a Coconut Cream Cake White Genoise layered with Coconut Cream and White Fluffy Icing with a drizzle of Rasberry coulis. Quite good but far from orgasmic. I would definitely go back to try some other dishes. The homemade bread they serve to start is wonderful. Overall I give them three stars out of five. Fundraiser to benefit Play On! A local, non-profit, community theater! Tons of gently used items donated by many families and community members. Bargain prices! Raffle with items donated by local crafters and vendors! Face painting for the kids! http://www.playontheatre.org for more info! Doug Schneider is a very talented man. He’s got a voice that can make lions purr and streetlamps swoon. So we’re very, very happy he’s coming back to Live Arts with a veritable suitcase of standards, a trunkload of tunes. 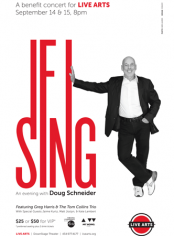 It’s IF I SING, a two-night stand of cabaret goodness starring Doug and a few of his friends. Backed by Greg Harris and The Tom Collins Trio, this is an evening of musical delights you don’t want to miss.